There’s always been something I liked about Simon & Garfunkel, though I’ve never bothered to take the time to analyse quite what it is. A job lot of their albums were up for sale and I bought them, 10 albums, for £21. So, doing the complicated math, they were £2.10 each, which I though was well worth it. 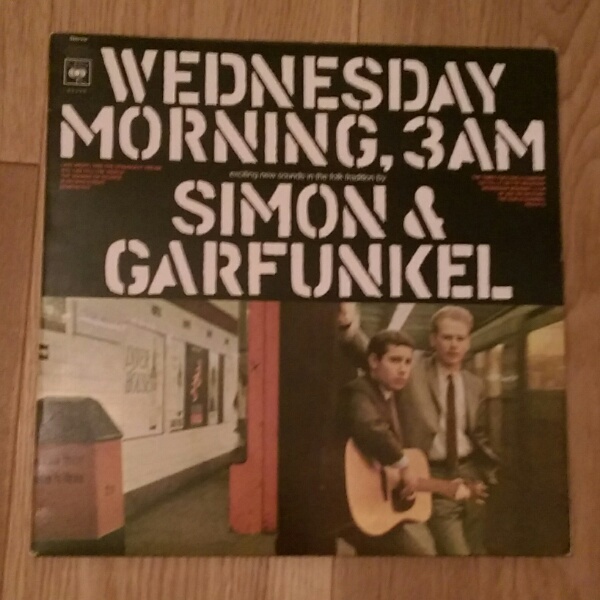 I’ll probably get around to posting about them all at some point but the first one I put on the turntable was ‘Wednesday Morning at 3am”. There was no logic to this other than the fact I liked the massive typeface on the cover, and possibly how impossibly young they both look. I didn’t realise that this was their 1964 debut release, which does seem a ridiculously long time ago, and didn’t know until I just looked it up. Apparently it didn’t do very well at the time and was re-released after radio success for the track ‘The Sound of Silence’. Going back to why I liked them, it’s actually a combination of things, not least of which is the song writing, which is of a consistently high standard, but it was other things as well. I think I associated them with “The Graduate” and the whole style of that film, and I also liked that Garfunkel was seemingly rather weird. Interesting I think that they only wrote half the songs on that debut, but I suppose, at the time, it was quite the norm to have others write for you or to do covers or traditional numbers, Dylan certainly did well with the latter. Here’s the ‘Concert from Central Park’ recorded in 1981. And below that “Wednesday at 3AM” on Spotify.